140 Prairie Points - that's what it took to pretty-up the edge of my new quilt. It arrived back from the lovely Dawn all quilted with a meandering design early in the week, then it was time to start pressing my three inch squares in half and half again! I like to attach my Prairie Points after the quilting and I also choose to use a facing rather than just turning under a hem on the backing fabric. That way the quilt can be quilted right out to the edges and the Prairie Points and backing fabric don't have to be pinned out of the way. Besides that, I like the finish better. 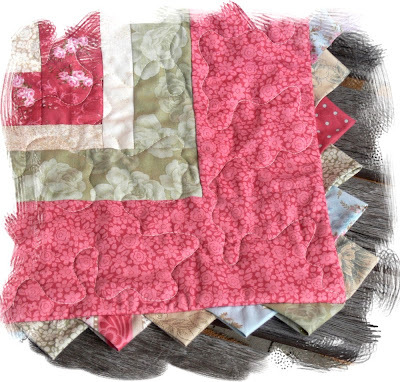 The secret to successful corners with the facing is this: Attach the facing to the right side of the quilt along one edge with an overhang of ¼ inch at the beginning and finishing ¼ inch in from the edge at the end. Cutting away excess fabric and batting at the corners also helps. I use a double-fold facing which means you don't have to turn under a hem but can just attach to the back of the quilt along the fold, as with a double-fold binding. I created a totally new block for this quilt and have called it "Disappearing Square". I hope a magazine editor will like it enough to want to publish it - three people who have seen it have all told me that it is lovely! The wall-hanging I have been working on is now at the quilting stage. I am hand-quilting the entire project as I never seem to have much success with the machine. Even just stitching in the ditch pulled all my lovely two inch squares skew-whiff, in spite of very careful pinning, using a walking foot, loosening the tension and stitching very slowly! 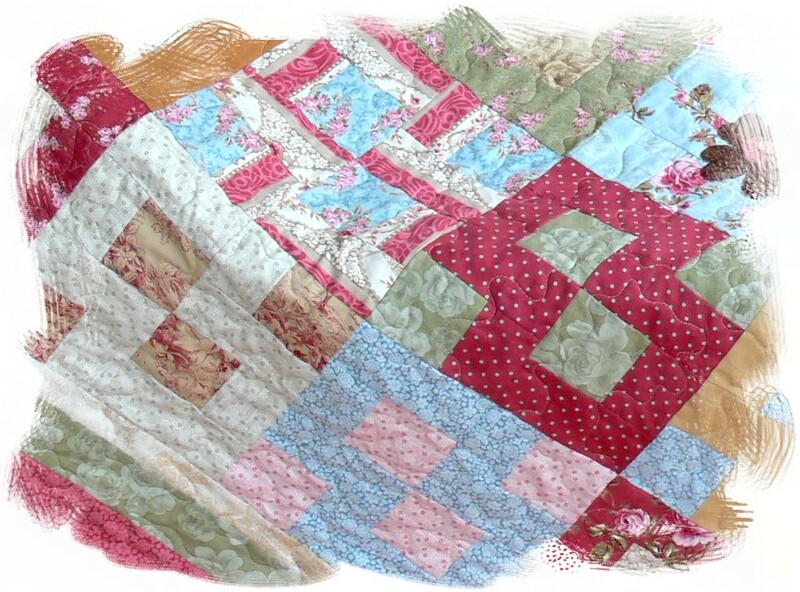 Needless to say, I unpicked the lot and now have straight two inch squares after hand-quilting around the blocks! Quilting - be it by hand or machine - is definitely the thing I like least! I can't wait till I get it finished. I like the results of all the little applique elements popping out - but the journey is something to be endured, not enjoyed! Seeing that project is almost at an end, it has been time to turn my attention to another design that has been commissioned. The brief is a needle book, pincushion and tape measure cover - reflecting my personal style. Do I have a personal style??? People tell me I do, but I find it hard to pinpoint it and describe it in words. As I am an 'incurable romantic', I guess that will show up in my designs. 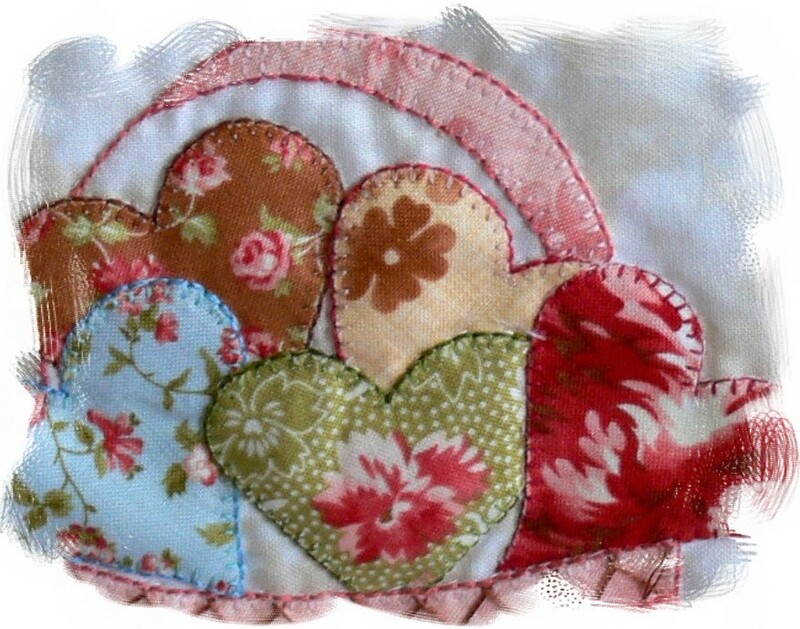 I love applique and I could never make anything that didn't have some sort of embroidery on it, ... but personal style? If anyone out there wants to tell me what it is, I'm happy to hear about it! Anyway, I managed to draw up the designs for the needle book and pincushion so I will soon have the excitement of starting a new project. I'll just have to presume they are in my own personal style!!! Oh my goodness Val, 140 prairie points - it looks amazing! And so do the hearts! I think you do have your own style, I would call it Romantic Whimsical. Whatever it is, I love it! That's a lot of prairie points! I can't wait to see the whole quilt. I would call your style vintage. It definitely comes through in the colors you use: cream, rose, soft green. And in the shapes: hearts and flowers. I don't think you'll have a bit of trouble creating something with these elements. You go girl! Oh my gosh is that a lot of points! All so pretty. Just love your designs my friend. Maybe you could say "Vintage Romantic" Great idea bout the prairie points - but can you show us the back too please?? 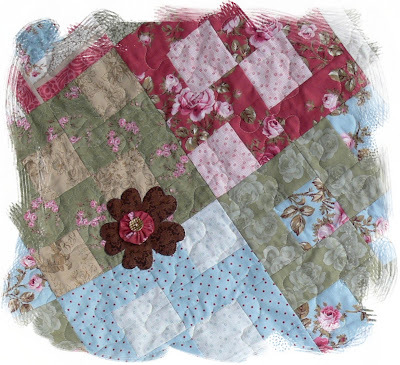 I found your page in my search for attaching prairie points when a quilt is already quilted...to the EDFE!... (I had it professionally quilted). Could you please oelaborate on how you do that?...when you use the facing thing? I didn't quite get it on the above reference....this was supposed to be a Christmas gift for my granddaughter,...a twin size...points all made...stymied...HELP! ?